Next we headed to the Tetons. Approaching from the east on Hwy. 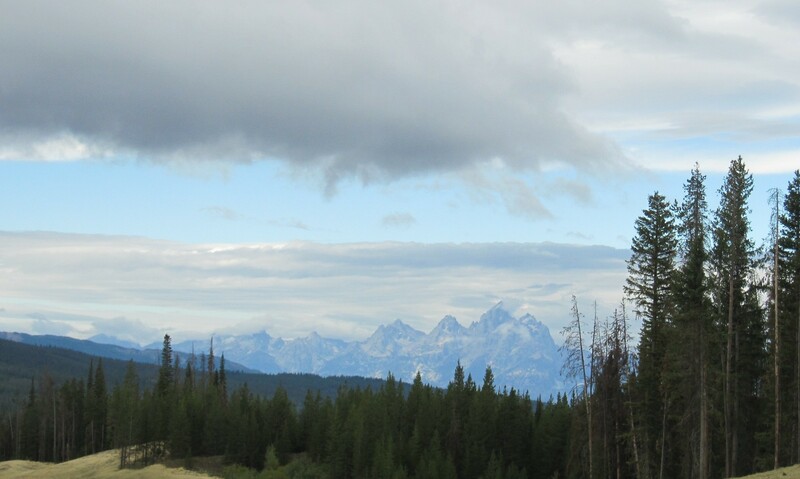 26, the Teton range is seen from the side, a great angle. What I didn’t expect was to see glimpses through openings in the trees as I was driving towards Moran Junction. I was stunned. 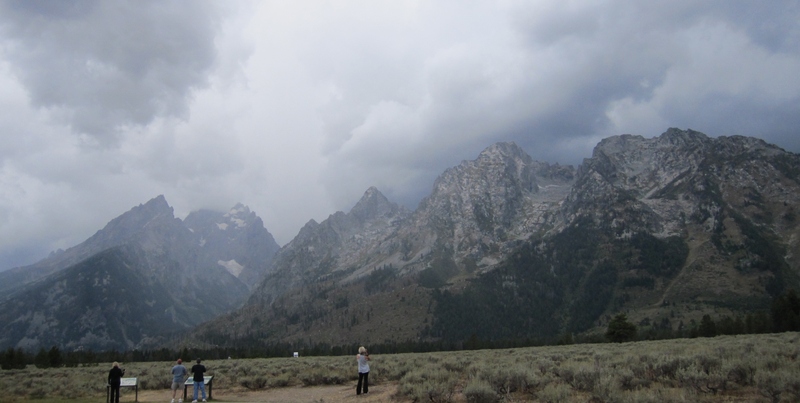 You see pictures, but nothing can prepare you for the first sighting of the Teton range. 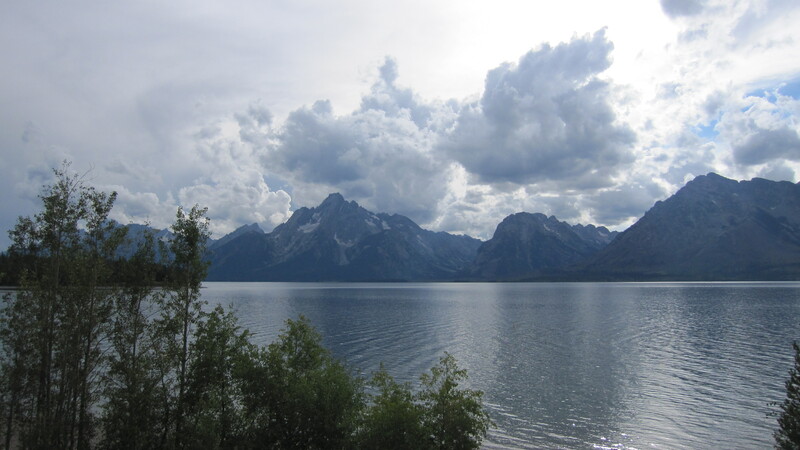 We stopped at a few places, including along the Snake River, a view made famous by Ansel Adams. We drove through the park down to Jackson, passing by fields of bison, to take care of our gas, grocery and internet access needs. 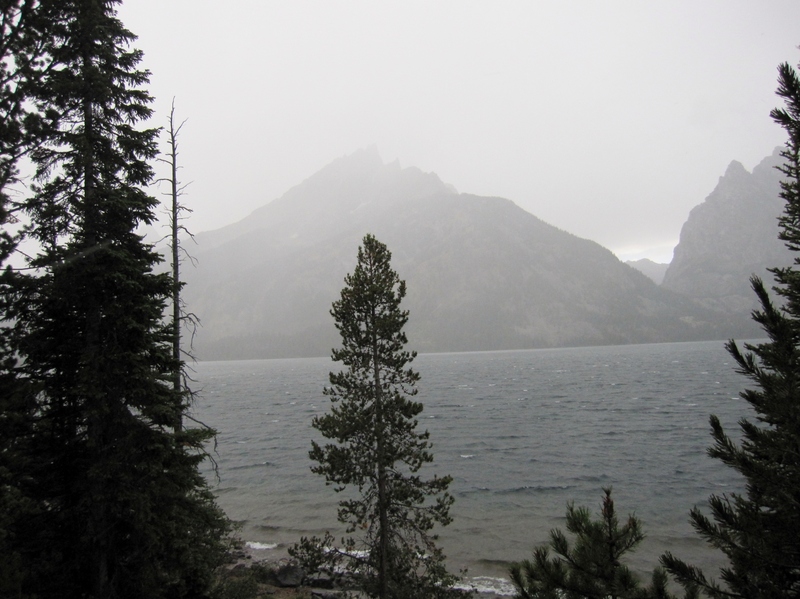 Then we took the park road back north, to the visitor center at Moose, to viewpoint pull-offs, by Jenny Lake, and to Jackson Lake, where we would get a site at Colter Bay campground. Another storm was gathering over the mountains and we were driving into it. 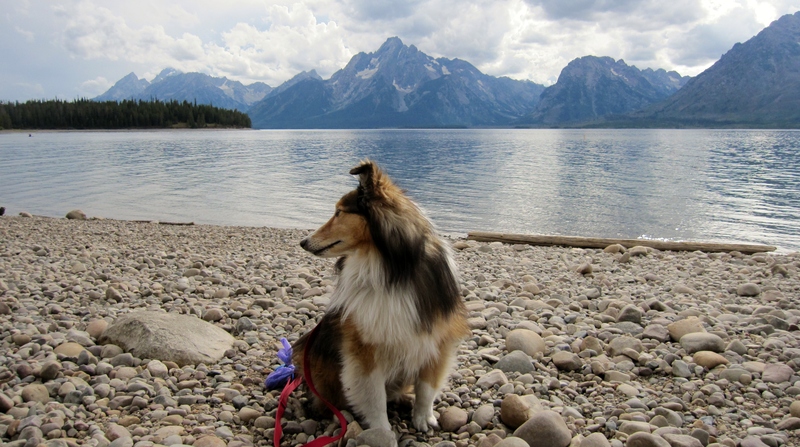 At Colter Bay, Riley and I walked around the area, including to the beach at Jackson Lake. Back at the campground we met Margaret, from New York, originally from Australia. She was traveling solo with her bird and tent camping out of her car. A spunky, lovely lady. The next morning we headed toward Yellowstone. 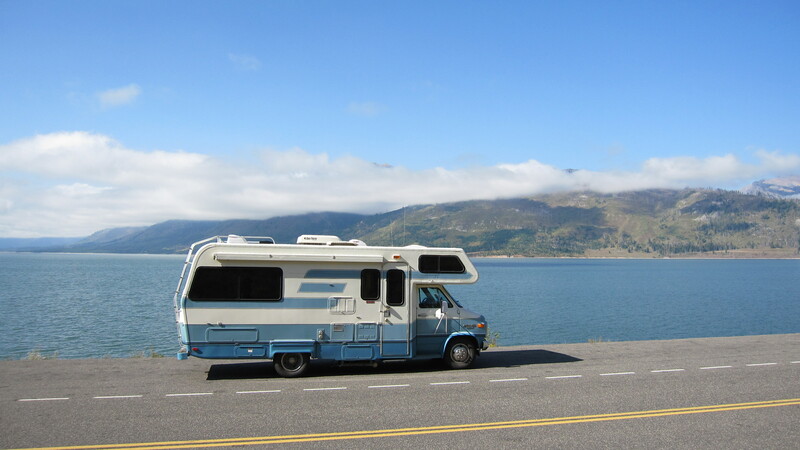 The road hugs Jackson Lake north of Colter Bay and I got a picture of Myrtle (my rig) with a pretty backdrop. The low clouds hide the tops of the mountains. You can just see a few tips above the clouds in places. 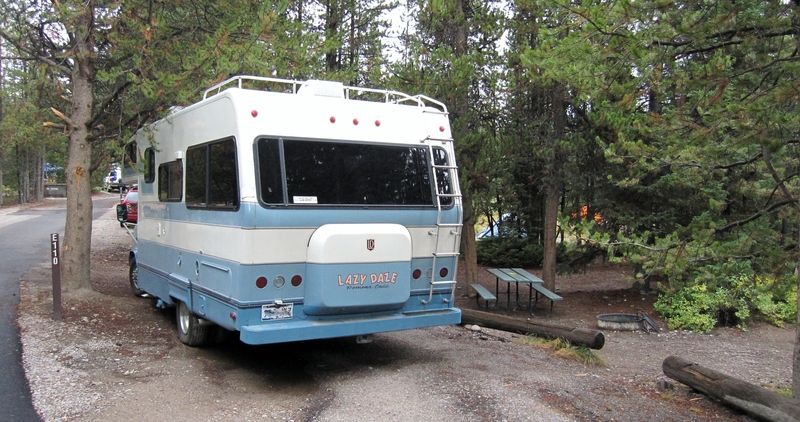 I had read about a park campground just south of Yellowstone, right on the Snake River and free! This post is already long enough, so will write about that stop separately. 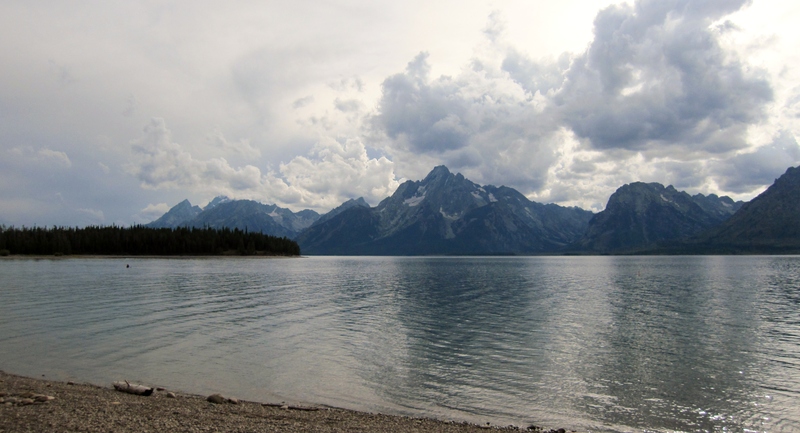 This entry was posted in Grand Teton National Park, National Park Campgrounds, Wyoming and tagged Colter Bay Campground, Grand Teton National Park, Jackson Lake, Wyoming by ontheroadwithriley. Bookmark the permalink. Great pictures. We are back from Fred’burg and did pretty well. Thanks! I think I took 200 pictures of the Tetons. Couldn’t help myself. They are stunning! Hi Jeanne (and Riley)! It was so nice meeting you – I’m looking forward to following along with you on your travels – especially since Katie and I have met you. Hugs to Riley! Hi Barbara! It was great to meet you and Katie! Thanks again for letting me pick your brain. Hope we cross paths again some day. Katie is such a cutie. Hugs to her, too!